I’m kicking off the new year with what I love to do most: update rooms in my home on the cheap, cheap, cheap. It gives me a deadline (because if I don’t have one I never finish projects) and challenges me to be creative (because it’s not easy to overhaul an entire room without spending a lot of money). The creative mind behind this challenge is Erin from Lemons, Lavender, and Laundry. 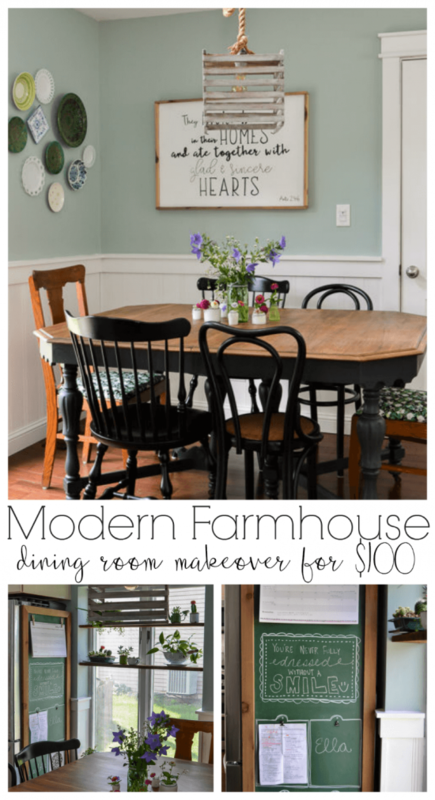 You can read all about how she started the $100 Room Makeover and see some of the spaces she’s made over here. Last year, I updated our eat-in dining area for $100, and even brought in a new table and chairs within this budget. It felt amazing to finally finish the space that had been partially finished for years, but I must say the most gratifying part was spending only $100 on the space. This time around, I’m giving our “middle room” a makeover. Wait – you don’t have a middle room nor know what it is? Haha, it’s okay; I don’t think it’s a traditional room in most homes. This room was creatively named because it basically sits in the middle of our house. Most people would probably call it a large hallway, because it connects two bedrooms, the living room, and the kitchen. However, with only so much space in our home, you better believe I need to change this room into a functional one. Every bedroom in our house is occupied (with two of our girls sharing a room), so this seems to be the best place to create a home office. It’s evolved a bit over the past 12 years, but has never actually been very functional or finished. 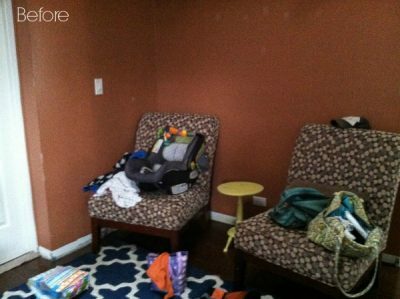 When we moved in, I kept the paint color on the wall and tried to match the chairs to the paint. Bad idea. Then, I bought this massive armoire on Craigslist, the truck broke down at the person’s house, and my husband and I were stranded for almost two hours. Thankfully, the people who sold us the armoire let us sit in their dining room. It was definitely awkward. I used this giant beast to store our office stuff, but never actually used it to sit at and work. Plus, I painted it bright teal, and hated it almost right away. Also a bad idea. We eventually painted the walls of the room, and I actually enjoyed the outcome of this decision a bit more than the others. Can you tell from these pictures that this room is basically just our storage for everything that doesn’t have a home? I didn’t really realize it until looking back at all the stuff that ends up in this room. A few years ago, I removed the doors from an old buffet, painted it, and turned it into toy storage and that took the place of the brown dot chairs. Then, last year, after we painted the walls, I created a gallery wall, so that right side of the room is basically finished. My plans for the rest of this space? 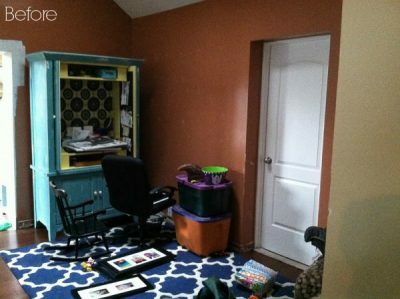 Completely update the left half of the room with a functional desk, wall storage, and a photo gallery wall. I also hope to add two more desks for my kids on the wall opposite the “room”. Next week, I’ll share my vision for the room, but for now, here’s a list of the projects I plan to complete this month. 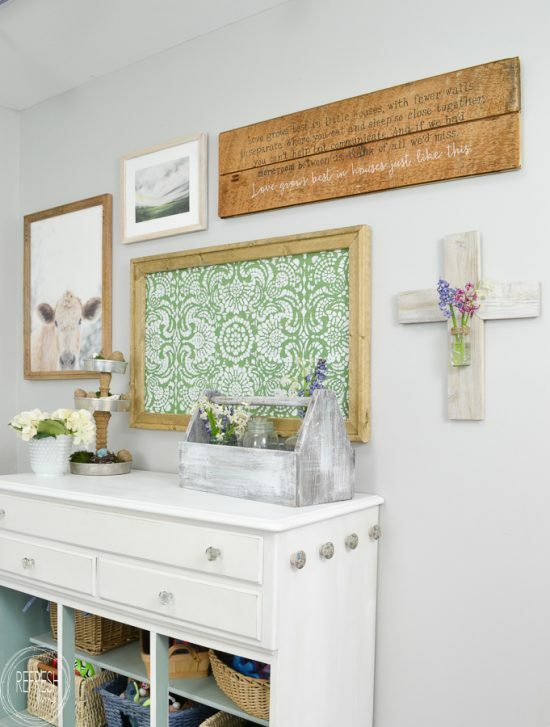 Create two desks along the wall for the kids. 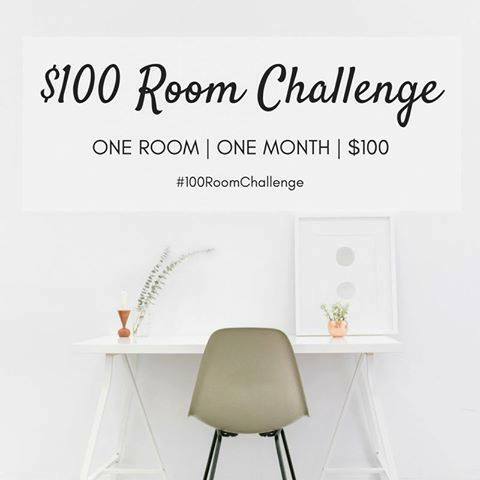 A bunch of other awesome DIYers are participating in giving rooms in their homes an overhaul for less than $100 this month too. You can see their rooms and plans by clicking on the images below. I can’t wait to see what you do! Especially the kids’ desk – I’m attempting to DIY a desk for our playroom and fingers crossed it works! I’m excited to follow along with you. 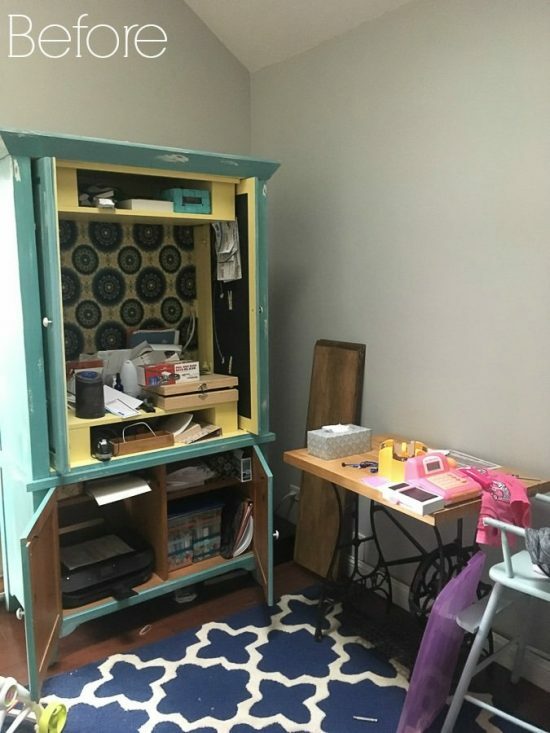 Glad to know that someone else makes decisions that don’t quite work out for you like the hutch color and the chairs (I’ve done this too many times to count). My husband always says, why don’t we just leave it alone? One day he will get it! Haha, my husband says the same thing! He always loves it in the end, but always questions me when the ideas start rolling! So fun to see how this space has already evolved, and I know it’s going to be great when you’re finished! I always love a good gallery wall so I’m super excited to see what you put up! Me too – I hope it turns out the way I’m envisioning! You’re off to a good start! I’m looking forward to following along. Thanks Emy! Can’t wait to see what your plans are for this one too! What a clever use for space. I’m glad you will have a dedicated spot of your own for your work and I’m super excited to see how it turns out. What a great way to start the year! I’m excited to see the gallery wall and what you use to paint the desk! That’s a great space! We had one in the upstairs at my old house. All that lived there was a bench no one sat on. I wish I had made it functional like your plan! I love to hear about the evolution of a space! It’s funny, we had a “middle room” too, but just called it our entry (I like “middle room” better!). It was basically a large hallway, but with our small house, we needed it to be a functional space. We made it a library/office space with the last ORC and it’s been awesome to have it as an actual room! I can’t wait to see how yours turns out! Anxious to see what you do with the space! 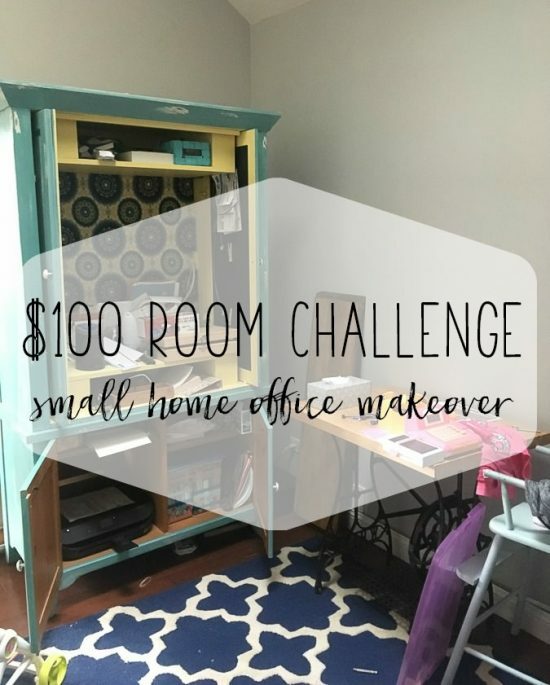 I’m kicking around making my home office my project in the next $100 Room Challenge. Love your ideas! I love what you have done so far with this space…and that you shared what you wished you hadn’t done. We’ve all done decor that we wish we hadn’t done. It’s going to look great though! I have never heard of a middle room 🙂 Excited to see what you do with this space… and I really think you can find a rug for under $30. I found some that worked in our entry at Walmart, and it’s held up great over the last year. The right side is so pretty already! It will be exciting to see what you with the rest of the space.